In the Chinese Lunar Calendar, 2014 is the Year of the Horse. The reverse design for the silver coins features two horses standing within a stylized Chinese landscape. The Chinese character for “horse” appears above the scene, while the inscription “Year of the Horse” appears below with the Perth Mint’s “P” mint mark also incorporated. The obverse features the Ian Rank-Broadley effigy of Queen Elizabeth II with the 2014 date, precious metal content, and monetary denomination. Year of the Horse, 2014. Silver coin Brilliant Uncirculated 1 ounce. Purity Ag 999/1000, gross weight 31.13 g, diameter 45.60 mm. Mintage of 300,000 coins. Available now for immediate delivery! 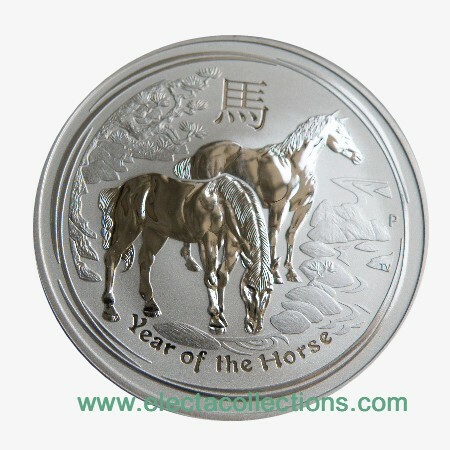 This entry was posted in PRODUCTS, World Coins Silver and tagged 1 oz, 2014, Australia, BU, Silver, Year of the Horse by Electa. Bookmark the permalink.